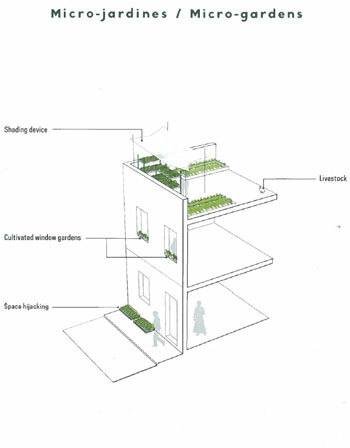 “Urban agriculture is a phenomenon today,” said Farham Karim, an architectural historian at the University of Kansas, at the Environmental Design Research Association (EDRA) conference in New Orleans. Upwards of 70 million people are now involved around the globe — on Farmville, at least, the popular game app, he laughed. But, in reality, there are many millions involved it in on the ground, too. With all the growing interest, Karim played devil’s advocate, wondering: is urban agriculture scalable? 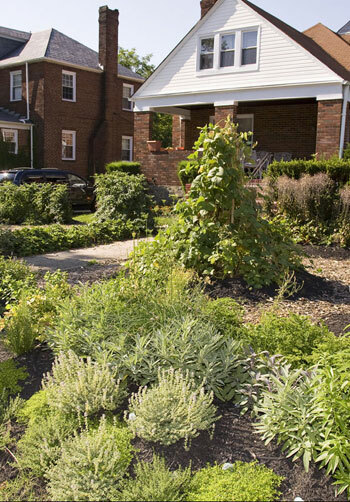 And who is going to be doing all this urban farming? And if we know it’s not a realistic solution for solving the world’s food problems, why the persistent interest? The central plank of Karim’s critique of urban agriculture is that in its promotion, it “mystifies human labor.” Urban agriculture in reality is “sweaty, painful labor.” Engaging human labor in cities over the long-term to farm is not easy, practical, or cost-effective. “Who is going to maintain these farms — a marginalized population? The working poor don’t have time.” Karim concluded that urban agriculture, at least in the West, is for the middle class who volunteer because they have time. It’s a luxury many can’t afford. Many of Karim’s arguments are contradicted in a fascinating new book, Farming Cuba: Urban Agriculture from the Ground Up by Carey Clouse. She argues that Cuba’s unique model of urban agriculture may provide lessons for the rest of us. “Alternative models for self-sufficiency demand our attention” given that “ending the era of cheap oil threatens global food security” and current industrial food practices. After the U.S. began its embargo against Cuba and the Soviet bloc fell apart in the late 1980s, leaving Cuba without any trading partners, the country initiated a massive campaign to turn cities into places for not only living and working but also producing food. “In the face of resource scarcity, Cubans responded by rethinking land use, implementing organic farming practices, and developing low-input agricultural systems, and honing techniques for independence on an island without oil.” By 2002, some 86,450 acres of urban Cuban land was being farmed, creating 3.2 million tons of food. In Havana alone, some 12 percent of the city was being cultivated, with 22,000 urban and suburban producers at work. 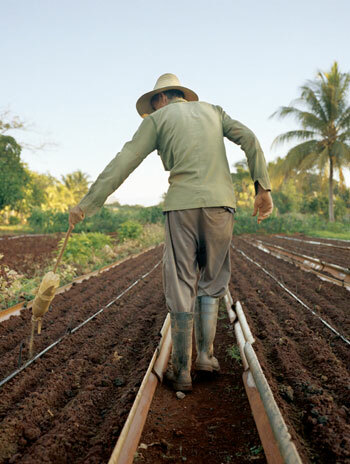 The system of socialist self-sufficiency extends into all aspects of Cuban urban food production. Farmers are using animal traction, organic soil amendments, biological pest control, and “biofertilizers” or “biopesticides,” which are microbial formulations nontoxic to humans. Clouse does a great job of explaining to the reader all the different farming types, bringing the diversity of the system to life through these clever diagrams. For each type of farm, we learn the spanish and english names, the average size of these places, their prevalence, the products they create, the materials they are made of, and the kinds of people who farm them. And then photographer Andrew Cook really brings this agricultural infrastructure to life. 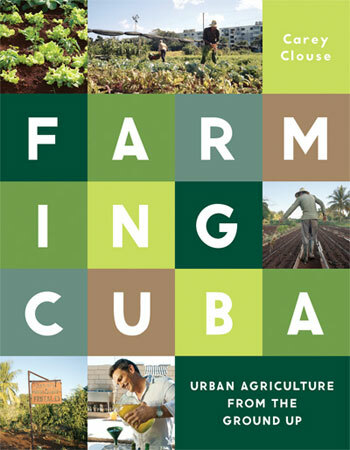 Clouse explains that “Cubans hail urban agriculture as a boon for community, occasionally in all too-idealistic terms.” But the reality on the ground, all that “sweaty, painful labor” Karim spoke about, doesn’t come through in this book at all. When you think of livestock, cattle, pigs, and sheep are probably the first animals to spring to mind. But it might be time to start thinking smaller. No, not chickens. Even smaller: Insects. Entomologist, and edible insect expert, Arnold van Huis joined us today to take our questions about why (and how) we would all be adding bugs to our diets in the future, and also gave us a run-down of some of the environmental perks which are move towards “mini-livestock” would bestow. They (as mini-livestock) are much more sustainable than conventional livestock: 1. They have a high feed conversion efficiency because they are cold blooded (e.g. for one kg of beef you need 25 kg of feed and for one kg of edible cricket you only need 2.1 kg of feed); 2) they produce much less greenhouse gases (methane and nitrous oxide); 3) they produce much less ammonia (causing acidification of the environment and eutrophication of waterways); 4) they can convert low value organic side streams into high value protein products. 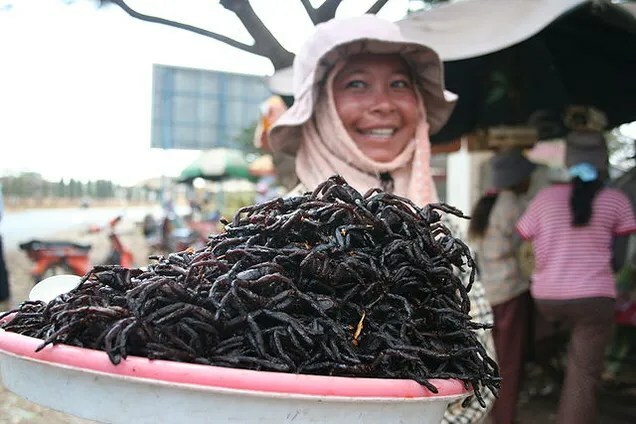 Concerning insects as feed for livestock and fish, I expect a bright future. Fishmeal, currently used, is getting too expensive (overexploitation of the oceans) and therefore the feed industry is really looking for alternative protein sources. Housefly and Black Soldier Fly are excellent candidates. These species can transform low value organic side streams into high value protein products. Of course, there’s still the queasiness-barrier to overcome before insects starts to rival chicken or beef for America’s hearts, minds, and stomachs. Though, that time may not be quite so far away. van Huis tells us that in his own blind taste tests, mealworm meatballs are currently beating the traditional version nine to one. Mientras que la seguridad alimentaria tiene por objetivo proveer alimentos sanos y seguros frente a la contaminación natural o accidental, el objetivo de la defensa alimentaria es proveer alimentos sanos y seguros libres de contaminantes añadidos de forma intencionada con objetivo criminal o terrorista, por alguien de la organización, o ajeno a ella, ya se trate de agentes NBQ, o cualquier otro tipo de agente físico. Debido a la amenaza de contaminación intencionada se hace necesario instaurar un Plan de Defensa Alimentaria en la organización o instalación que minimice o anule las amenazas de contaminación intencionada, en cualquiera de sus posibilidades, sobre la cadena alimentaria en todas las fases de producción. Resultando fundamental realizar un análisis de riesgos, así como integrar el concepto de defensa alimentaria dentro del programa de seguridad alimentaria y del programa de autocontrol, identificando y caracterizando los peligros, así como evaluando la exposición y riesgos. Para lo cual se evaluarán las vulnerabilidades de la instalación, así como el grado de concienciación de la organización en todos los niveles, resultando fundamental el uso de herramientas de apoyo a la decisión para alcanzar el objetivo de Defensa Alimentaria. Documento elaborado por Alberto Cique Moya. I just spent more than a week experiencing Soylent, the most joyless new technology to hit the world since we first laid eyes on MS-DOS. 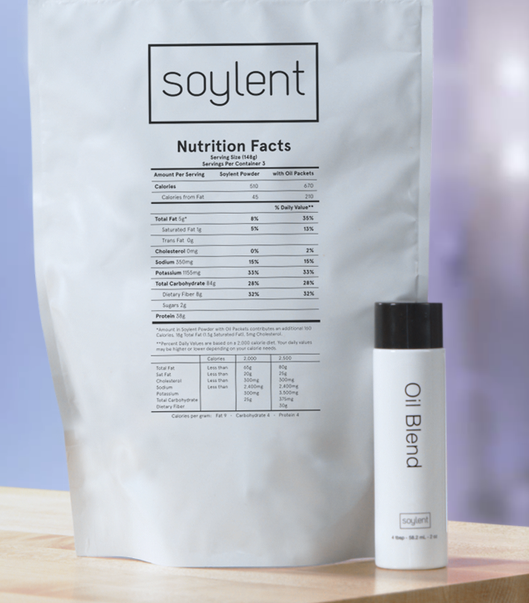 Soylent is a drink mix invented by a group of engineers who harbor ambitions of shaking up the global food business. Robert Rhinehart, the 25-year-old co-founder and chief executive of the firm selling the drink, hit upon the idea when he found himself spending too much time and money searching for nutritious meals while he was working on a wireless-tech start-up in San Francisco. Using a process Mr. Rhinehart calls “scientific,” the firm claims to have mixed a cornucopia of supplements to form a technologically novel food that offers the complete set of nutrients the human body needs for survival. You can live on Soylent alone, Mr. Rhinehart claims, though in practice he said customers would most likely use it to replace just their “staple meals,” by which he meant most of the junk you eat every day to fill yourself up. Mr. Rhinehart argued that Soylent, which costs about $3 per serving, is cheaper, easier to prepare and more nutritious than much of the food that makes up the typical American officer worker’s diet today.